Golden Hornet produces pink-white blossom in spring, followed by a mass of small yellow fruit which will stay on the tree until late in the year providing a useful color feature in the garden. The leaves also turn an attractive yellow color in the fall. Golden Hornet is an excellent pollinator for most apple varieties, particularly mid and late-blooming varieties, as it produces a lot of blossom over a long period. 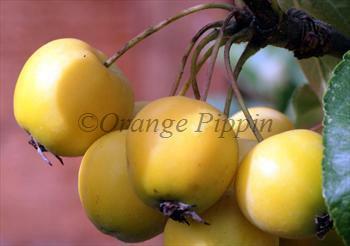 The fruits are useful in the kitchen, for crab-apple jelly and a source of pectin for jam-making. Fill in the details below and we will let you know when Golden Hornet crab apple trees are back in stock. Thought to come from the UK in the first half of the 20th century. It is possibly a natural cross between Malus sieboldii calocarpa and Malus prunifolia coccinea.